I like rock movies. Love em in fact; A Hard Days Night, Don't Look Back, The Band's Last Waltz, Woodstock, Monterey Pop, Message to Love (IOW 1970), Ziggy Stardust and on and on. I'm always looking for the next great one to add to my collection, a great DVD package to add to my list. But what I never get to do (aside from Ziggy Stardust, twice) is watch them at the cinema. So, yesterday, I did both. I added a new movie to my favourites and got to see it on the big screen! The movie in question is Festival Express. Directed by Bob Smeaton (the Beatles Anthology) this documentary is a combination of old footage and new interviews from the participants. 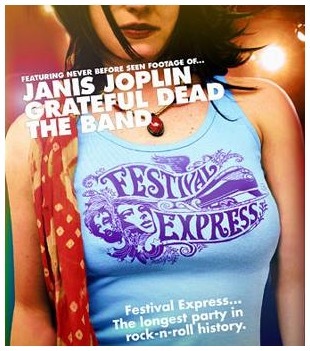 The synopsis is thus: In 1970 a group of musicians played 3 festivals in Canada, travelling to each on a train. In short, they got on the train in eastern Canada and partied, sang, played, drank and smoked their way across the provinces to Ontario, Saskatoon and the final gig in Calgary. As ever with these rock movies of the late 60s/early 70s it's part historical timepiece and part thundering concert film. This one differs from Woodstock et al because it contains new interviews with the participants, some recalling events with more fondness than others. In particular I'm talking about the misery of promoter Ken Walker, not the most likeable of guys in any event. The recollections of the musicians involved were wholly more happy and the image you get is of one long party, musicians trapped on a train for a day or two at a time amusing themselves by jamming. Oh to be a fly on the wall on that journey. There were some acts I was looking forward to seeing more than others. I haven't seen much live of the Grateful Dead and was expecting a turgid set of endless soloing but I'm happy to report that was not the case, I really enjoyed their performance and the spectre of Jerry hangs over the film, he seems to be in almost every frame; big smile on his face, an intimate portrait of a much loved man. He didn't have a bad word for anyone and brightened every frame he was in. Janis Joplin is, well, Janis. There’s no-one like her and I was almost literally blown across the room watching her; there really are no singers like her left. Her style, a slight screeching vocal, can be challenging to listen to (especially in Dolby Surround sound) but her songs and delivery are what it's all about. She held the crowd in the palm of her hand, the Canadian audiences sat enraptured. I was looking forward the most to The Band. I'm a huge fan of theirs and have seen precious little footage of them aside from Scorsese's rock masterpiece The Last Waltz. They played at Woodstock but were left out of the original film and the directors’ cut. They were never a glamorous band, they looked old even when they were young and hid the pretty-boy looks of leaders Robbie Robertson and Rick Danko as best they could. In fact Danko has a hilarious scene on the train with Garcia and Janis, later in the movie when, totally wasted, he tries to lead everyone in song. What a rare experience, getting to see a rock movie on the big screen, learning something new about each band and discovering a transcendent performance by another artist, Buddy Guy, perhaps the movie's highlight. The slightly bizarre presence of gold lamé clad doo-wop dancing troupe Sha Na Na (they were at Woodstock too for some reason) doesn't detract a bit from the film, in fact it adds a bit of levity. That train must have been a cool place to be on - no sleep, just good company and good music. If you can see this movie, take the chance. Most of the great past musical events to be committed to celluloid have been discovered; this one could be the last great festival movie to be found.